When both parents are track coaches, you don't have much of a choice how you spend your after school and weekend hours. 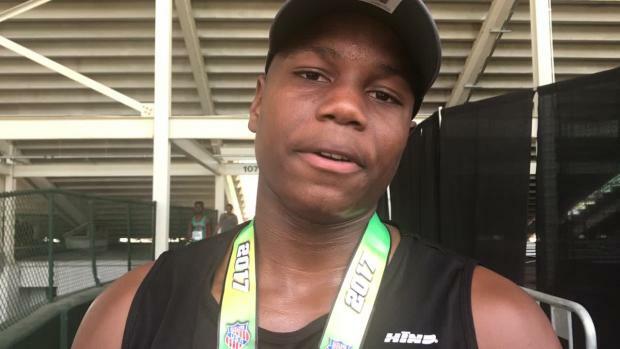 In the case of Gary Moore Jr., son of Hillhouse coaches Gary and Michele Moore, he took advantage of his unique life situation and has developed into one of the best track athletes in the nation for his age group. The younger Moore recently won the pentathlon in the 13-year-old division at the AAU Junior Olympic Games in Detroit Michigan last week. He did this with a balanced approach to the five events and won the high jump at 5'3 and shot put with a throw of 43'11.25. He also took top five in the 100HH with a time of 15.71 for a PR, and ran the 1500m in 5:03.63. His only off event was the long jump where the rising 8th grader, who has a PR of 17'6 only managed a 15'7. His total score was 2795 points, which is only 180 points off the national age group record set by Ayron Monroe of Upper Marlboro, Maryland seven years ago. The 5'11, 156lb Moore talked about his approach to the five-event competition and said "I was going in ranked 1st but got a lot of confidence after I set a PR in the hurdles. I knew would do well in the shot and take over first place." Besides his parents, Moore is coached by Bloomfield throws coach Damien "Big Country" Larkins who stated "he is an extremely driven and humble young man who gives maximum effort. Competition brings him to another level. It's amazing the gains he has made when a challenge is on the line." Going into the meet, Moore felt he had a good chance at breaking the meet record. Even though that didn't happen, he is still optimistic he can break the record next year. His high jump coach, former Hillhouse athlete Gabe Abdul Karin, taught him how to learn from his failures. "He always says when you knock the bar down, you still learn something." Larkins added "even when he wasn't at his best he always excepted the consequence and it made him work even harder. He learns from all of his experiences, good or bad. After the pentathlon, Moore threw 49-8.25 with a 4k shot to finish 2nd and also took 3rd in the 200 low hurdles with a time of 27.54 in the 13 year old age group. Moore attends Engineering and Science University Magnet School on the campus of the University of New Haven. ESUMS is a 6th-12th grade school and he will be eligible to compete for his parents at Hillhouse High when he enters high school in the fall of 2018. One of his goals is to win the CIAC state decathlon his freshman year. It usually takes years to master all ten events and no freshman has ever come close to winning. In fact, the only sophomore to win the event was Amity's David Karabinos who won three straight titles in 2011, 2012 and 2013. But Moore has the talent, the right attitude, the coaching and by the time he enters freshman year he will have more track experience than just about everyone else in the field. The best is yet to come for this youngster raised in the sports of track and field.